iCarol is more than just contact management software — it is the center of a modern digital system through which you can communicate with and serve visitors via whatever channel they prefer, including text messaging and live chat. iCarol is our only product, built from the ground up specifically for helplines, non profit and charity contact centers. 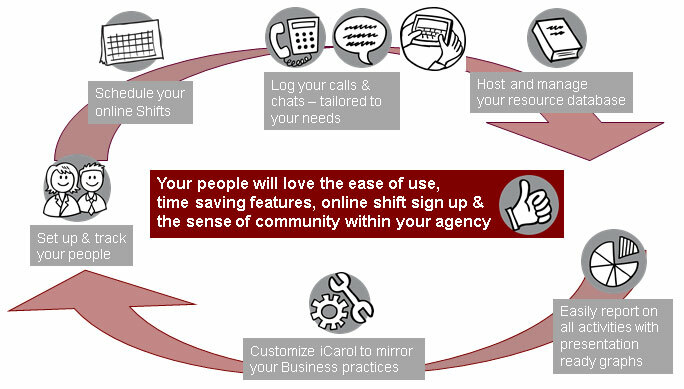 iCarol’s web based software automates the service delivery process for non-profit and charity contact centers. We take your call content and live chat service, and integrate it with resource referral, scheduling and staff and volunteer management. iCarol automates the process of storing, organizing and retrieving it all. In doing so, iCarol creates opportunities for you to improve your center’s organizational processes and results. You obtain the information necessary to be able to improve on service delivery, productivity of staff and volunteers, and the availability of volunteers. You can also measure the impact your help line has in your community and deliver the results to your organization’s board of directors and funders. 100% Web Based – iCarol was built from the ground up as a web based application. Because we are web based, we can provide you with all the services normally required by an IT department with one low monthly subscription price. This means – we provide the technology infrastructure and all the maintenance, upgrades, back-up and recovery, feature upgrades, support, and training. With iCarol you are always on the most current version. There is never a need for you to devote time to installing complex upgrades – we do that for you seamlessly. And as most enhancements are released, they automatically become part of your iCarol system. Authorized Affiliates can access iCarol securely from any internet device. Each participant is configured by your administrators with very specific privileges assigned so they can only see what they are authorized to see and can only do what they are authorized to do. This infrastructure gives you the ability to quickly and effectively grow a small network into a large national network – all with the full support of iCarol technology and staff. Extensive security measures – Because we work with helplines around the world, we understand that client confidentiality is a paramount concern. iCarol passes a frequent independent security audit, achieving the same level of security that is required for transactions among the major international financial institutions. All data is encrypted — from the time it leaves your computer all the way to the hard drives on our servers — with the same technology used by major banks, credit cards, and online retailers. All user logins require passwords, which are encrypted, and we offer the ability for you to restrict the computers on which data can be accessed. Our datacenter is protected by state-of- the-art physical and electronic security measures. We are proud of our stellar uptime track record. Resource management – Our clients rave about the elegant and powerful manner with which resources can be managed, searched, and referred. Our tools allow your staff to maintain a quality, up-to-date, thorough, error-free, and easy-to-search database. With more than 100 standard fields and unlimited custom field availability, your iCarol database provides operational flexibility for optimized efficiency. Our integrated Public Web Directory provides quality access in an easily searchable format for your public visitors. The iCarol Auto-Verification functionality gives your specialists the tools they need to maintain updates easily, ensuring the quality and integrity of your data. Our new workflow capability gives resource managers and quality assurance staff an easy way to track record management throughout the process. And our API can be used to give secure real-time access to your data for special projects such as creating mobile apps or custom-built websites. Statistics and reporting – For all aspects of iCarol, you can create dozens of attractive charts and tables at will, giving you insight into who you’re serving, when, their needs, and much more. Your Text, Chat and Referral data will roll up to your National system for a real- time view of all activity. Contact logging – Each encounter you have with a client can be logged with whatever data is essential for internal operations and funders. iCarol’s system for doing so is extremely versatile and can be tailored to match your workflows. Staff and volunteer management – Your people are your “product” and managing them from recruitment to end-of-service is vital. iCarol helps you track their contact information, service history and credentials, and set their security privileges. Online shift scheduling – With your people in place, now you need to make sure your shifts are staffed with the right number of people at the right time. With iCarol you can establish recurring and one-time shifts, assign people to those shifts, manage exceptions and allow folks to find their own substitutes, all within parameters you define. Collaborating with Partners – Easily set up a disaster plan amongst your Affiliates and other helplines around the country. With iCarol and the proper permissions in place, centers in non-affected areas can quickly and easily begin to log texts, chats, and give referrals for centers that may be unable to respond or are overloaded – all with security access to only the information they need. Decreases expenses of partnerships since each partner can use the same system without additional training, etc. Training and Support – Get up to speed on iCarol easily and quickly! Access our online support system 24/7/365 for categorized and searchable help articles. Sign up or view one of our many educational webinars. Access our white papers, case studies, blogs and guides. Connect with leaders from non-profit helplines around the world through the online iCarol User Community. With over 100 help articles and a library of training videos you have wealth of easy-to-access information at your fingertips. Customers rave about our support and attention to customer needs – go ahead and ask!